AT MY "REAL JOB" (MID-NORTH HAULING) WE WERE IN THE SHOP UNPACKING FROM THE KINOOSAO SCRAP RELOCATION PROJECT WHEN THE PHONE RANG. THE HIGHWAYS DEPARTMENT GRADER HAD BROKEN DOWN AND THE ROAD NEED TO BE PLOW. BUDDY BARRY'S 740 CHAMPION GRADER HAD JUST BEEN IN THE SHOP SO IT WAS READY TO GO ON A MOMENTS NOTICE. I LEFT THE SHOP AT 2pm AND HEADING UP THE KINOOSAO RALLY ROAD TO START PLOWING THE 7" OF FRESH SNOW WHERE THE HIGHWAYS GRADER STOPPED PLOWING. AFTER THIS PICTURE THE BATTERY IN THE CAMERA DIED AND OF COURSE I FORGOT TO BRING THE CHARGER. I PLOWED THE ROAD UNTIL 1am AND THAT IS WHEN I SPUN OUT ON THIS LITTLE HILL. SINCE THE SNOW WAS TOO DEEP TO PLOW UP THE HILLS, I WAS RUNNING THE HILLS IN ROAD GEAR TO MAKE IT UP AND THEN PLOWING DOWN THE OTHER SIDE. THEN ON THE WAY BACK I CAN PLOW DOWN THE HILLS WHICH WAS THE UP SIDE ON THE WAY OUT. THIS MAYBE CONFUSING BUT MAKES FOR COMMON SENSE. I GOT TO SLEEP IN THE GRADER FOR 3 HOURS UNTIL GEO Ron SHOWED UP BRING FUEL FOR THE GRADER. 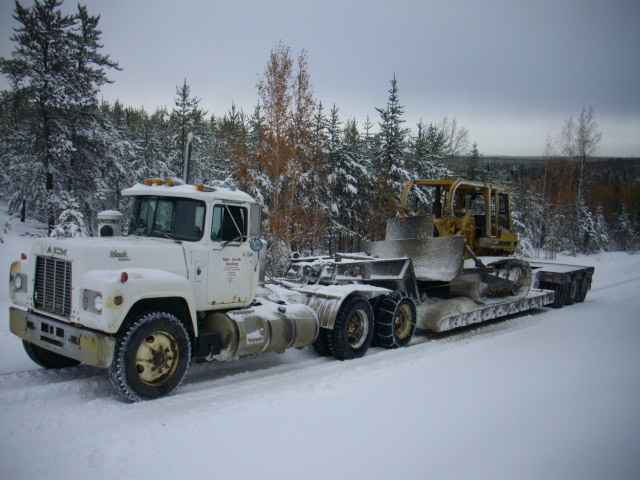 THEN IT WAS A NICE DRIVE BACK TO LYNN LAKE TO GET THE D6D CATERPILLAR TO PULL THE GRADER OUT. WHEN WE ARRIVED IN BACK AT THE SHOP AT 7am, BUDDY BARRY WAS LOADED UP TO HEAD SOUTH FOR A LITTLE CUDDLE ACTION. 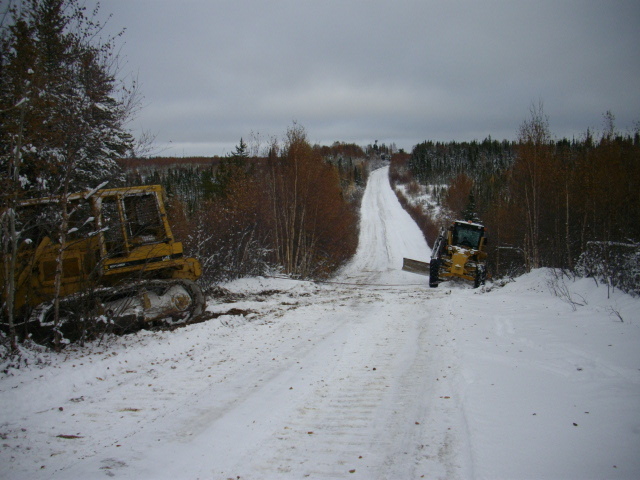 WHEN HE ASKED WHERE THE GRADER WAS I TOLD HIM IS WAS PARKED SAFELY ON THE SIDE OF OF A HILL ABOUT 97kms FROM THE SHOP. ALL HE SAID WAS AT LEAST IT IS PARKED SAFELY AND JUST HANDLE IT AS HE GOT IN HIS VEHICLE TO HEAD SOUTH. GEO Ron AND I DECIDED A LITTLE SLEEP WAS IN ORDER SO AFTER A 2 HOUR CAT NAP WE HEADED OUT WITH THE D6D ON THE OLD MACK. BUT TRACTION IS A LITTLE PROBLEM WITH THE TRUCK BECAUSE IT IS TOO OLD FOR THE 4 WHEEL LOCK UP THAT ALL THE NEW TRUCKS HAVE. ALSO WE STARTED OUT WITH LOTS OF TIRE CHAINS BUT BY THE END, WE HAD WRECKED THEM ALL. I TOLD GEO Ron THAT NOW ALL THESE CHEAP TIRE CHAINS HAVE BEEN DESTORIED. BUDDY BARRY WILL HAVE TO BUY THE GOOD ONES NOW, LOL. 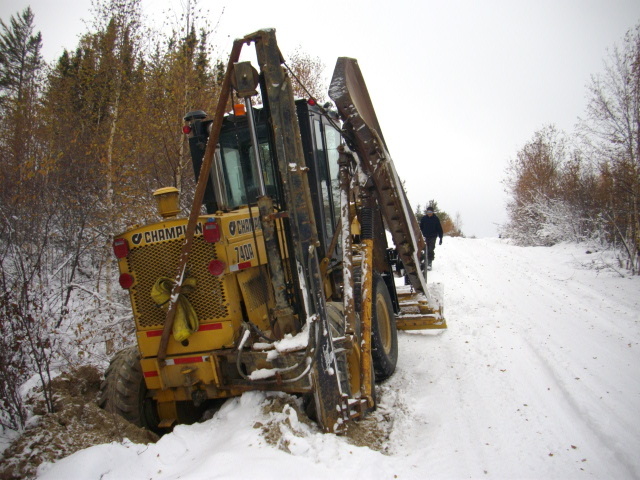 WE UNLOADED THE CAT ABOUT KILOMETER FROM WHERE I GOT THE GRADER STUCK. 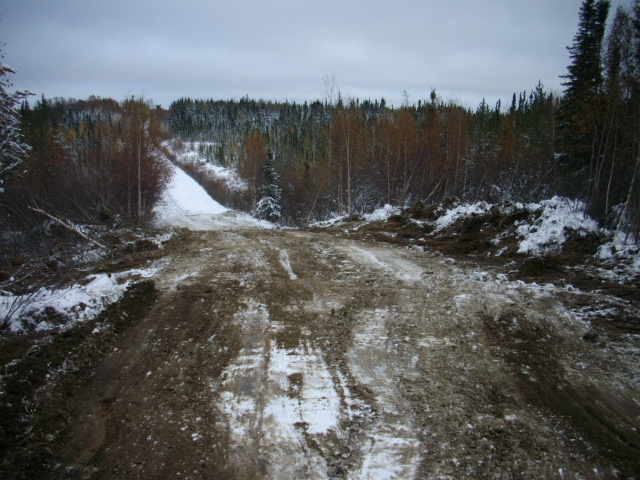 THAT WAY IT WAS GOOD GROUND INSTEAD OF MUSKEG FOR SIDE LOADING AND UNLOADING THE CAT. PLUS I PLOWED THE ROAD AS I WALKED THE CAT TO THE GRADER. YES THE GRADER WAS STUCK REALLY GOOD AND I MADE IT EVEN WORSE BY TRYING TO GET OUT OUT USING THE WIGGLE SWITCH ON THE DASH OR THE MOLDBOARD. THE FUN PART WAS GETTING THE D6D UP THE HILL BECAUSE IT WAS ALL ICE FROM THE WATER NOT BEING ABLE TO FLOW DOWN THE DITCH SO IT FLOWED DOWN THE ROAD INSTEAD. AFTER SLIDING DOWN THE ICE HILL A COUPLE TIMES WITH THE D6D CAT. IT WAS NOT FUN ANYMORE. I GOT THE CAT ACROSS THE ROAD AND DID A GOOD PULL TO GET THE GRADER OUT. GEO Ron GOT TO LEARN HOW TO DRIVE A GRADER VERY QUICKLY, LOL. 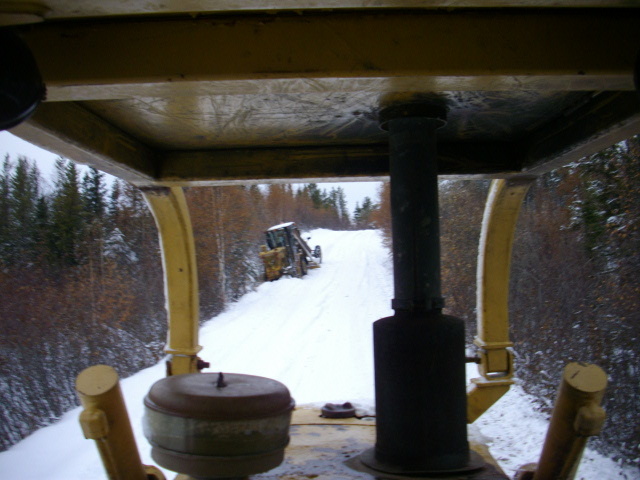 WITH THE GRADER OUT OF THE WAY, I WENT AFTER THE DITCH WITH THE CAT TO GET THE WATER TO FLOW DOWN THE HILL INSTEAD OF OUT ON THE ROAD. I THEN USED THE DIRT TO SAND THE ROAD TO MAKE IT SAFE FOR THE NEXT TIME THE ROAD IS GRADED. 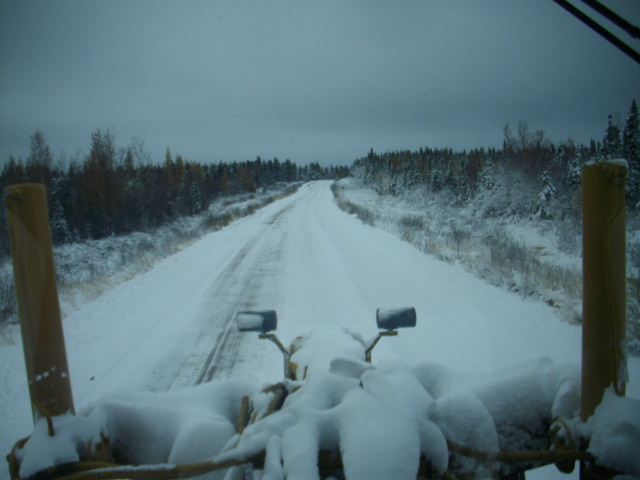 I THEN MADE THE MANAGEMENT DECISION NOT TO PLOW ANYMORE WITH THE GRADER BUT TO TRAVEL THE LAST 10kms USING THE D6D TO PLOW THE ROAD. THE HILLS GET BIGGER AND BIGGER THE CLOSER ONES GETS TO KINOOSAO. 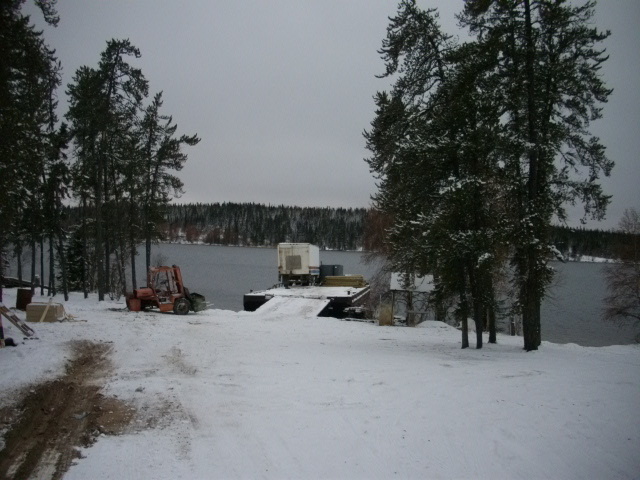 WHEN I ARRIVED IN COMMUNITY I FOUND A LITTLE FORKLIFT WITH A BROKEN AXLE AND A SEMI THAT NEEDED TO BE UNLOADED ON TO A BARGE FOR THE COMMUNITY OF BROCHET. THE D6D WORKED WELL FOR CARRYING STUFF TO THE BARGE. WE CHAINED IT TO THE BLADE AND USED THE WINCH OVER THE TOP OF THE CANOPY FOR THE LIFTING ACTION. WE GOT THE BARGE LOADED AND OFF WE WENT BACK PLOWING. 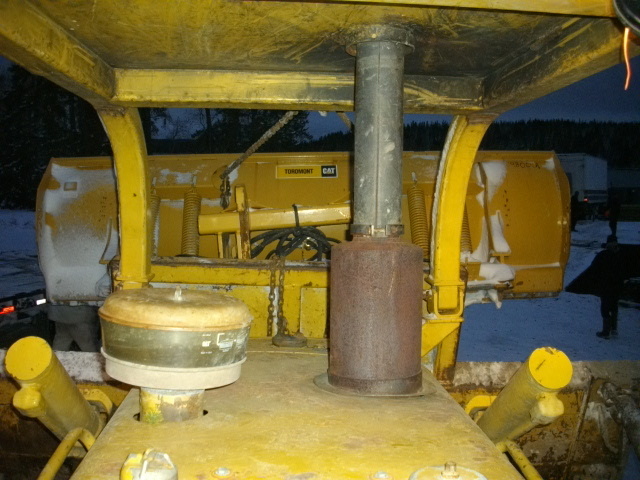 ONCE AGAIN THE CAMERA DIES SO WE NO PICTURES OF PLOWING ALL NIGHT BACK TO LYNN LAKE PLUS MOVING THE SEMI WITH THE D6D CAT EVERY 20kms TO KEEP UP WITH THE GRADER.